CHARLOTTE, NC. 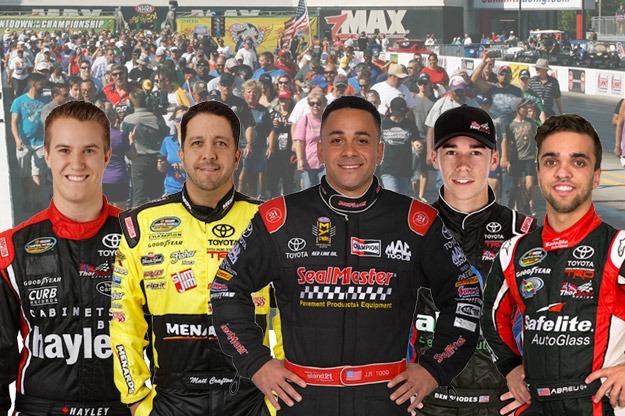 (April 7, 2016) – Kalitta Motorsports and J.R. Todd, driver of the SealMaster Top Fuel dragster, are pleased to welcome NASCAR Camping World Truck Series (NCWTS) and ThorSport Racing drivers Rico Abreu, Matt Crafton, Cameron Hayley and Ben Rhodes to the NHRA 4-Wide Nationals. The drivers will join Todd in participating in the SealMaster Track Walk prior to the beginning of the NHRA race action. ThorSport Racing and SealMaster, the most trusted name in pavement maintenance for more than 40 years, are part of the ThorWorks Family of Brands. SealMaster is in first season as the primary sponsor of Todd’s Top Fuel dragster and is an associate partner on the remainder of the Team Kalitta NHRA entries driven by Las Vegas winner Alexis DeJoria, Doug Kalitta and Del Worsham. “It is always interesting to have drivers from other motorsports to the track and get to show them what we do,” said Todd. “I am excited to have my NASCAR teammates to the drag strip and let them experience some of the NHRA racing action.” Todd debuted the new look SealMaster ride to a semi-final finish in Pomona and returned to the semi-finals this past weekend in Las Vegas. He currently ranks sixth in the point standings. Abreu is the two-time, and defending Chili Bowl Nationals Champion and is in his rookie season in the NCWTS with ThorSport Racing. Crafton, the only driver to win back-to-back championship titles in the NCWTS, is coming off a career-best 2015 season with six race wins. Hayley is in his sophomore season with ThorSport Racing and is the only full-time Canadian driver in the NCWTS. Rhodes, the 2014 NASCAR K&N Pro Series East Champion, started his NCWTS rookie season off with back-to-back top-10 finishes at Daytona (Fla.) International Speedway, and Atlanta (Ga.) Motor Speedway. “Personally inviting drivers from our sister company, ThorSport Racing, to the 4-Wides is just one more example of the great job J.R. and Kalitta Motorsports do to serve partners and introduce fans of other teams and sports to the world of NHRA drag racing,” says SealMaster Communications Director Debbie Hufford.